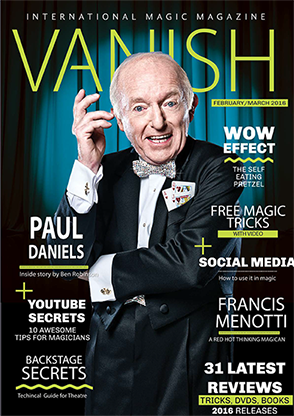 Today, when you order "VANISH Magazine - January/Febuary 2016 - Paul Daniels", you'll instantly be emailed a Penguin Magic gift certificate. You can spend it on anything you like at Penguin, just like cash. Just complete your order as normal, and within seconds you'll get an email with your gift certificate. Once a year Paul Romhany chooses one edition of VANISH to remain FREE for ever and offer it to ALL magic dealers to share with their customers as a download. On Friday it was announced that Paul Daniels is dying from a brain tumor. This came as a shock to the entire magic community and in honor of the amazing work of Mr. Daniels edition 24, The Paul Daniels Edition, will be the one that remains available to everybody. The story on Paul Daniels is written by his close friend Ben Robinson and is a profile and in-depth interview with this truly great entertainer. This is NOT a puff piece. It is solid, spot on interview with the truth as our rudder. In a world where everyone is "legendary" and a "genius" the words hold little sway for those who really deserve the encomiums. Paul Daniels is worth every accolade you shall ever hear or read. And he worked for it. 200 pages of the latest reviews, articles, essays and magic tricks by working professionals. 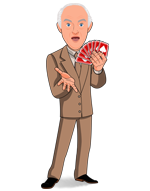 A fantastic way to help promote the art of magic and offer something very special to ALL of your customers.